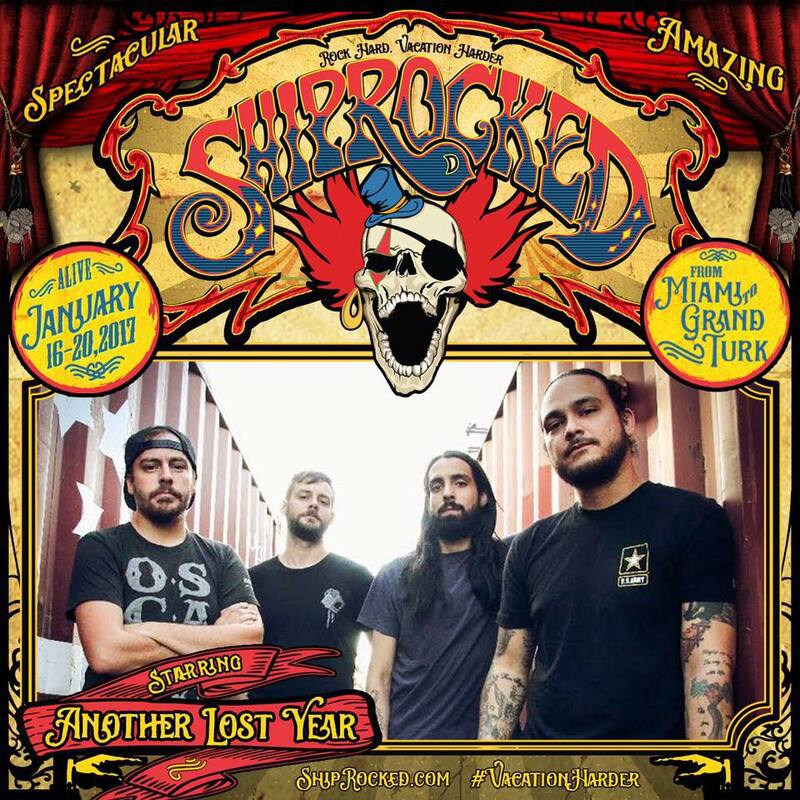 Another Lost Year is getting Shiprocked! 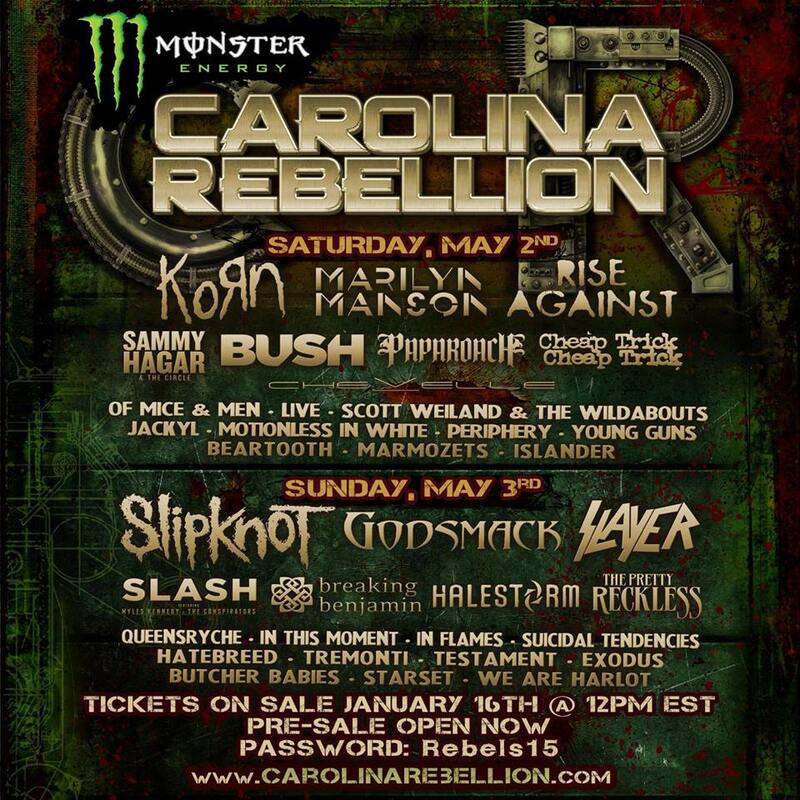 The Charlotte, North Carolina-based band has been announced as the latest addition to the 2017 edition of the annual Shiprocked cruise. The cruise will feature a number of today’s top rock acts including but not limited to: Breaking Benjamin, Papa Roach, Alter Bridge, Sevendust, Pop Evil, and The Stowaways. The floating music festival will be held aboard the Carnival Victory. The liner will sail out of Miami Florida on January 16th, 2017, and make its way to Grand Turk in the Turks and Caicos before returning to port on January 20th, 2017. Also featured in the 2017 Shiprocked cruise will be: Avatar, Crobot, 12 Stones, and many others. A very limited number of rooms is still available for the 2017 Shiprocked cruise. VIP packages are sold out. Pricing information for the available rooms is noted via the official Shiprocked website. Before the band takes to the high seas it will also perform live at the 2016 Laconia Fest Motorcycle Music Festival. The Laconia Fest is part of what is billed as the “oldest motorcycle rally on the planet.” The nine-day festival takes place at Weirs Drive-In Theatre in Laconia, New Hampshire from Saturday, June 11th to Sunday, June 19th. The debut installment of the Laconia Fest will feature performances from some of the top acts from rock’s past, present, and future. They include but are not limited to: Steven Tyler, Lita Ford, Ted Nugent, Warrant, LA Guns, Dope, Everybody Panic!, Sevendust, Buckcherry, Fuel, Saving Abel, and many more. General Admission tickets and VIP passes are available for a number of the festival’s performances. General admission tickets include: Admission to the Festival village, the FMX Stunt Show, Main stage & EMP Group Label Group – Stage 2 Views, and more. VIP Pit passes include: Exclusive, best-position access to stage-front from the Pit viewing area, 2 complimentary tokens, and access to cash bar and other amenities. VIP Tower passes are also available. They include: Exclusive access to an elevated 15-foot platform with premium stage view, private bar with beer and other drinks, prepared box meal, luxury accommodations, and other optional extras. Those extras come at an added cost. Wheel chair access will also be available for the festival. Tickets and VIP passes allow for “all-day” access to the Laconia Fest and all related events and attractions. Tickets are sold on a per-day basis and re-entry is allowed per day. More information on ticketing, VIP passes, performance lineups, and more is available on the festival’s official website. The band’s performance at the Laconia Fest is just one of a number of dates that is on ALY’s current live schedule. The band will be live today in Chesterfield, Michigan before heading to Janesville, Wisconsin for a performance there this Sunday, May 15th. Performances in Pinehurst, NC and Charlotte, NC on June 2nd and 4rth are also included in that schedule, which is noted below. 5/12/2016 Chesterfield MI @ Diesel w/ P.O.D. 5/18/2016 Belvidere IL @ Apollo Theatre w/ P.O.D. The long wait for Sevendust’s new album is almost over. The band—Lajon Witherspoon (vocals), Vince Hornsby (bass), Clint Lowery (guitar/vocals), Morgan Rose (drums/vocals), and John Connolly (guitar/vocals)—has announced that it will release its fan-funded acoustic album Time Travelers & Bonfires will be released nationwide in April. The upcoming all-acoustic compilation will feature a collection of new songs mixed in with re-worked versions of songs such as: ‘Black’, ‘Gone’, ‘Denial’, ‘Karma’, ‘Trust’ and ‘Crucified’ just to name a handful of songs. Time Travelers& Bonfires isn’t the first time that Sevendust’s members have delved into the acoustic side of their songs. The band released the highly acclaimed live acoustic recording Southside Double-wide in 2004. 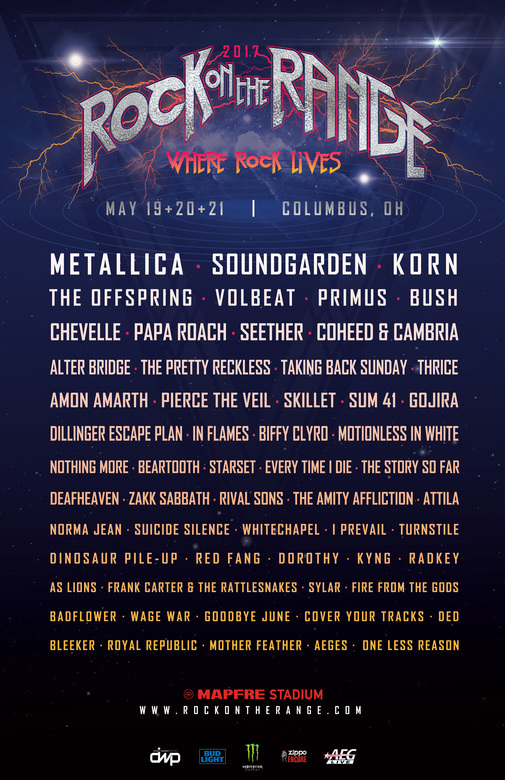 One writer with All Music Guide wrote of that recording, “Fans should invest readily in Southside Double-Wide…Sevendust’s famously confrontational sound smolders, and damn it if their sensitive side isn’t just as fiery.” The complete listing for Time Travelers & Bonfires is available below. In conjunction with the album’s release, the band has also announced a supporting tour beginning April 1st in its hometown of Atlanta, GA. 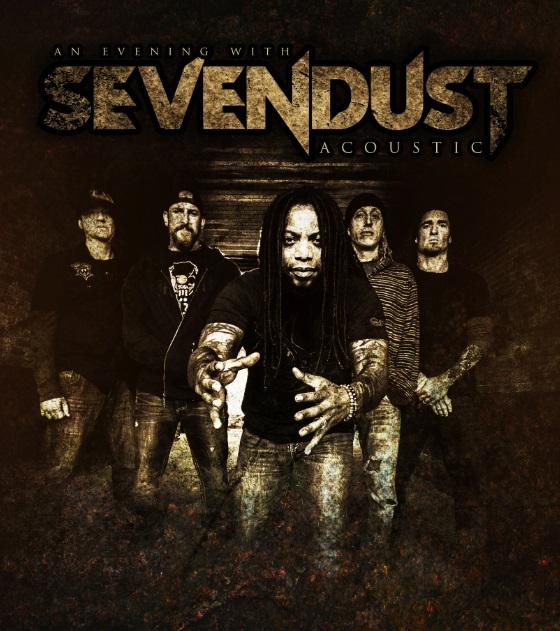 The band’s “An Acoustic Evening with Sevendust” tour spans twenty-eight dates. The current tour schedule sees the band making its way from the south to the West Coast (including the Pacific Northwest) before swinging back through the nation’s heartland and back around to the Northeast. The most current tour schedule is listed below. Before the band hits the road this Spring, it will be part of the annual ShipRocked cruise. It will be in good company when the cruise leaves port. Also scheduled to perform on the cruise are: Papa Roach, Five Finger Death Punch, Three Days Grace, In This Moment, Tremonti, Black Stone Cherry, and a slew of others. The cruise will depart from the Port of Miami this Sunday, January 26th and will return next Thursday, January 30th. While at sea, the cruise will take audiences to Great Stirrup Cay, a private island in the Bahamas. A small number of staterooms for this year’s cruise is still available. Vacationers and audiences get info on that limited space online at the official ShipRocked website, http://www.ShipRocked.com. More information on Sevendust’s upcoming tour, new album, and more is available online at http://www.sevendust.com, http://www.facebook.com/pages/Sevendust/25493613958, and http://twitter.com/sevendust. To keep up with the latest sports and entertainment news and reviews, go online to http://www.facebook.com/philspicks and “Like” it. Fans can always keep up with the latest sports and entertainment news and reviews in the Phil’s Picks blog at https://philspicks.wordpress.com.